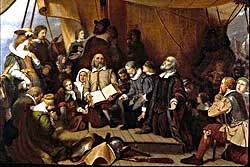 Depicting the Pilgrims as they leave Holland for new shores, "The Embarkation of the Pilgrims" can be found on the reverse of a $10,000 bill. Too bad the bill has not been printed since 1946. Religious strife reached a peak in England in the 1500s. When Henry VIII broke with the Catholic Church of Rome, spiritual life in England was turned on its ear. The new church under the king's leadership was approved by the English Parliament, but not all the people in England were willing to accept the Church of England. At first, the battles were waged between English Catholics and the followers of the new Church — the Anglicans. The rule of Queen Elizabeth brought an end to bloodshed, but the battle waged on in the hearts of the English people. The Pilgrims, called the Separatists in England because of their desire to separate from the Anglican Church, were persecuted by agents of the throne. The Puritans, so named for their desire to purify the Church of England, experienced the same degree of harassment. Pilgrims and Puritans both believed in the teachings of John Calvin. According to Calvin, neither the teachings of the Catholic nor the Anglican Churches addressed God's will. By the end of Elizabeth's reign, England was a nation of many different faiths. John Winthrop was a spiritual and political leader of the Massachusetts Bay Colony. He was elected governor of the colony in 1629. The Stuart family, who ascended to the throne after the demise of Elizabeth, made matters worse for the followers of John Calvin. King James and his son Charles supported the Church of England, but secretly admired the ceremonies of the Catholic Church. To these kings, Calvin was a heretic, a man whose soul was doomed for his religious views. The Pilgrims, called the Separatists in England because of their desire to separate from the Anglican Church, were persecuted by agents of the throne. The Puritans, so named for their desire to purify the Church of England, experienced the same degree of harassment. By the second and third decades of the 1600s, each group decided that England was no place to put their controversial beliefs into practice. 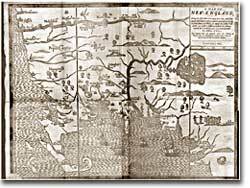 This map, the work of William Hubbard, depicts the expanding New England colonies as they were in 1677. Where else but in the New World could such a golden opportunity be found? The land was unspoiled. Children could be raised without the corruption of old English religious ideas. The chance to create a perfect society was there for the taking. The Stuart kings saw America a means to get rid of troublemakers. Everything was falling into place. By 1620, the seeds for a new society, quite different from the one already established at Jamestown, were planted deeply within the souls of a few brave pioneers. Their quest would form the basis of New England society. It started with the inexplicable behavior of two young girls -- by the end, 24 "witches" were hanged, stoned, or died in jail -- however, none was burned in Salem! Priscilla was the only girl approaching marriageable age on a ship with well over fifty young and single men. Here's the real story of the Mayflower!